Jesse Oliver was a medic in Afghanistan, but back home in Pine Mountain he’s happy to switch gears as the Double Shot bar’s new sous chef. When his apartment floods and his old Army buddy offers the family’s dilapidated lake house as temporary quarters, Jesse thinks a little remodeling on the creaky duplex sounds like a fair return favor. That’s before he sets eyes on the gorgeous woman moving into the other side of the cabin—and discovers she’s his buddy’s kid sister, a.k.a totally off limits. Normally I glom Kimberly Kincaid’s books as soon as I get my hot little mitts on them, but for some reason, I didn’t jump into Just One Taste as soon as I got my copy. Looking back now, I am thankful for that, because one Sunday when I was stuck in bed feeling cruddy, I had a favorite author that I could read – which always makes you feel better. This was a cute/short entry into the Pine Mountain series and was just what I needed. We previously meet Jesse in the last book of the series and knew that he had some secrets/background that he didn’t necessarily want to talk about and I remember after reading the last book, I was like, I want to know more about him. I will also admit that I’m a sucker for friend/sister (or friend/brother) type romances, mostly because there is that idea of the idea of a hands-off type approach (meaning does any brother want their friend dating little sister…). But Kat wasn’t the meek heroine that seems so present in many contemporary romances today – in fact she was uber-smart and not scared to show it (and you could tell that Kimberly had done her research into the educational background that Kat possessed because it rang true to me). The conflict between Kat and Jesse was intriguing and I totally sided with Kat on the need for own space (that’s why i’ve not had roommates since college). But seeing the relationship develop between the two of them was a fun ride and I enjoyed how they had multiple points of intersection in their lives before they ended up staying in the same cabin. 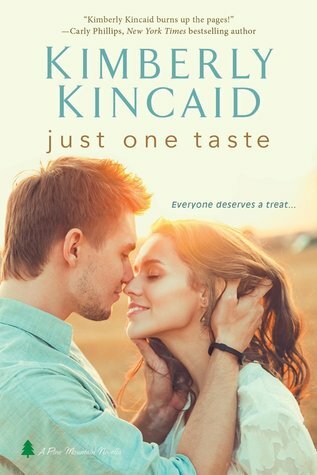 Just One Taste had Kimberly’s trade-mark sassy dialogue and witty humor, as well as steam resulting smexy scenes. I’m just disappointed to know that this series is wrapping up soon (even if I know she’ll have other books coming out). If you want a smexy handyman type romance, with an extremely smart heroine, then Just One Taste might be the book for you. Are there more coming in this one? New firefighter series? Yay!! !